U.S. Surgeon General Dr. Jerome Adams visits with customer-owners during his tour of the Bentah Nuutah Valley Native Primary Care Center. Southcentral Foundation welcomed many distinguished guests as the summer drew to a close, ranging from grantmakers, to a federal commissioner, and the nation’s top doctor. As a two-time Malcolm Baldrige National Quality award recipient, leadership is always happy to share what makes SCF a global leader in health care. U.S. 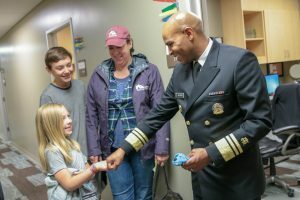 Surgeon General Dr. Jerome Adams’ first trip to Alaska included a tour of the Benteh Nuutah Valley Native Primary Care Center and the Anchorage Native Primary Care Center. Dr. Adams, who has served in the post since September 2017, was impressed by SCF’s Nuka System of Care. “There are really two things that came through. Number one is the care that is provided here. The folks really care about the customer-owner. You can see it’s not just delivering a service — it’s about really meeting the needs of the individual. “The second thing that comes through is integration. The care is integrated from start to finish. If you need traditional healing that’s going to be provided but that’s going to be integrated with all other facets of healing. “I’ve not seen anything like this across the country. I can see why SCF has won awards for the care they are providing. I just can’t wait to tell the rest of the country about what I’ve experienced today,” said the U.S. Surgeon General. While on the Alaska Native Health Campus, the Surgeon General addressed the U.S. Commission Corps officers and toured the Alaska Native Medical Center. The opioid crisis is U.S. Surgeon General Jerome Adams’ top priority. Dr. Adams described the opioid epidemic as an “all hands on deck” crisis. Commissioner Brendan Carr with the Federal Communications Commission was also impressed by SCF’s health care delivery system. During his tour of the Anchorage Native Primary Care Center, Commissioner Carr was briefed on SCF’s telemedicine capabilities. The goal of his trip was to get a better understanding the challenges of internet access in remote communities. For more than 20 years, Rasmuson Foundation’s acclaimed Grantmakers Tour has brought influential foundation leaders to Alaska. This year, nine funders toured Southcentral Foundation and were treated to a sneak peak of the Dr. Katherine and Dr. Kevin Gottlieb building. The newest facility on the Alaska Native Health Campus houses the Alaska’s Cleft Lip and Palate Program, dental, OB-GYN, and Child and Family Developmental Services. Funders play a key role in SCF’s ability to offer world-class health care. SCF has received more than $3 million from Rasmuson grantmakers — which translates into funding for facilities and programs that benefit customer-owners. SCF would like to thank all the visitors who allowed us to share our story of how the Nuka System of Care is transforming health care.